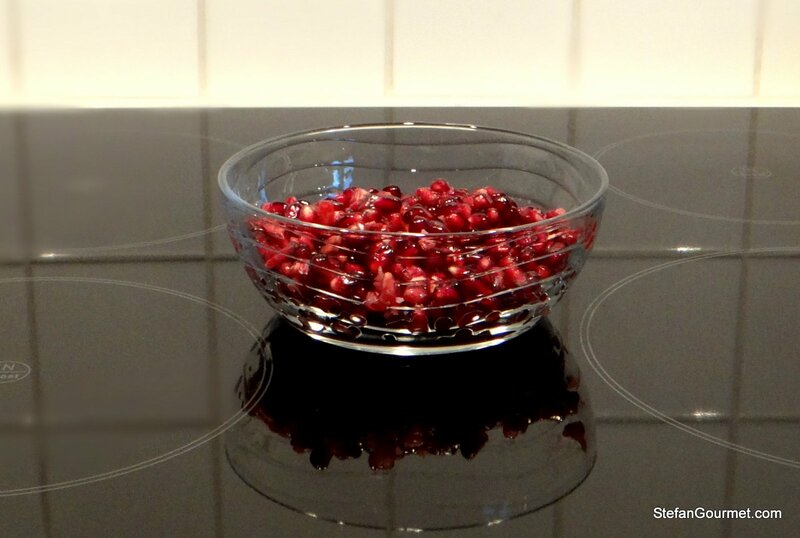 Yesterday I wrote about my ‘discovery’ of fresh pomegranate juice, and complained about the messy procedure to get those arils (seeds) out. 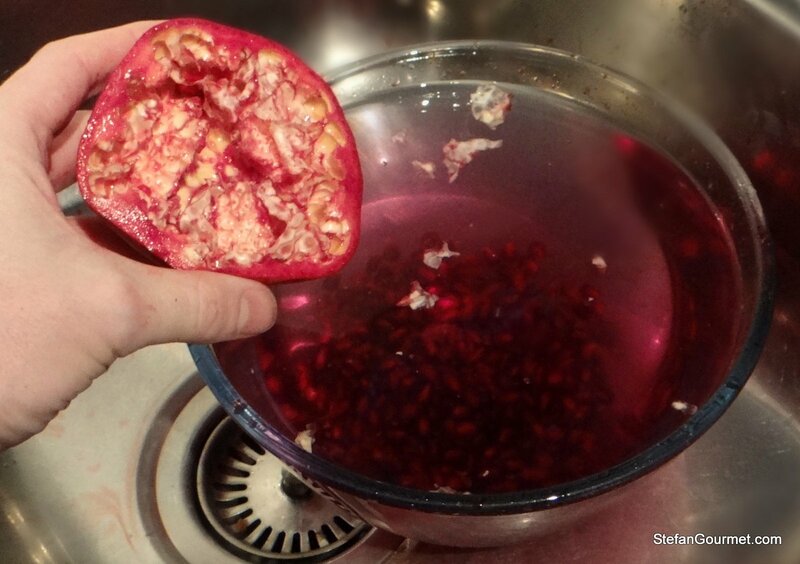 Paul and Fae reacted that there is an easier way, which is to whack the pomegranate with a wooden spoon to let the arils fall out. Since I had another pomegranate waiting to be turned into more delicious juice, I decided to try this for myself. And although I still got some small splashes of juice (probably due to my clumsiness), it worked a lot better and quicker. Thanks Paul and Fae! It is always great to learn a new technique. First score the pomegranate on the equator, trying to avoid cutting the arils. 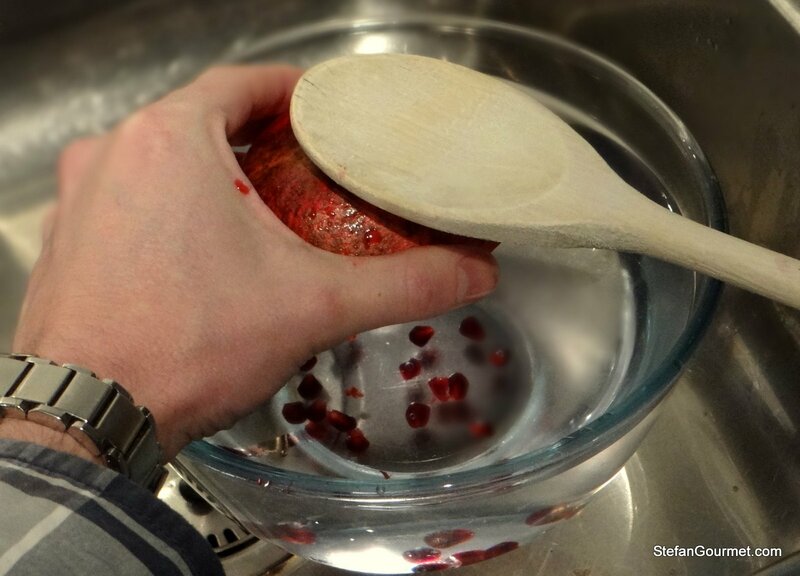 Here comes the magic: whack the pomegranate with a wooden spoon to let the arils fall out. 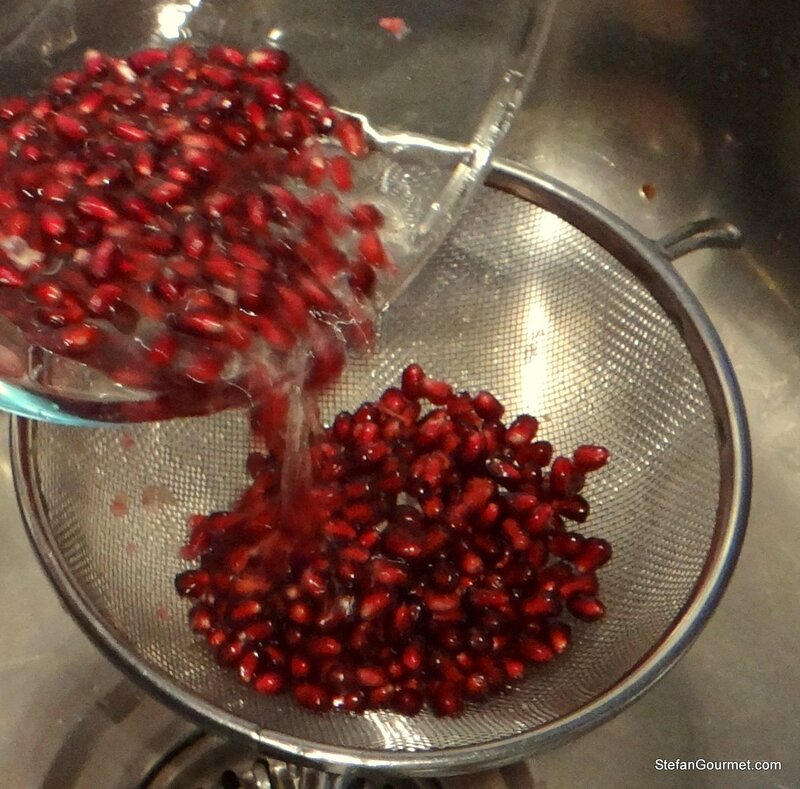 It helps to loosen up the seeds a bit by squeezing or pulling on the sides. You have to whack quite hard to make all of them fall out, so be careful not to hit your hand. I still used a bowl filled with water to catch the arils, as this makes it easier to remove the white stuff that will float to the surface. As you can see, the method got most of the seeds out. I couldn’t resist including a pouring shot of getting rid of the water. Tadaa: lovely arils with a lot less effort and a lot less mess. You can juice them or use them as is. If you are not sure how to do this, check out this YouTube video that I found. Two years ago I wrote about how to make fish stock. There are no pretty pictures to include here, but I won’t miss up on another opportunity to tell you how important and how easy it is to make your own stocks for soups, risottos and the like. Fish bones and heads are free and it will only take half an hour to make your own delicious fish stock. Just make sure that you soak the bones and heads in cold water before using and that they are fresh to avoid a bad smelling stock. 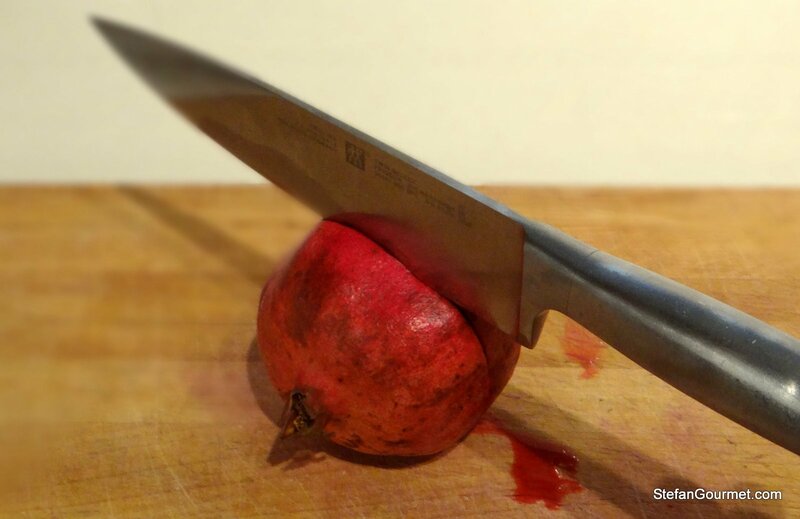 I can’t believe this: i cracked open a pomegranate just half an hour ago!!! and without hitting it … What an incredible coincidence. There must be a pomegranate mania doing the rounds on the internet (and a very good ‘mania’ it is too, considering how healthy pomegranates are). Nigella Lawson started off the hitting it with a wooden spoon method, in one of her programmes. What fun! Great tip, thanks to all concerned and for demonstrating the technique! The best tip for debearding mussels I can give is simply NOT to debeard them. Recipes often tell you to do this, but I rarely do. Usually I only serve a few mussels in the shell for decorative purposes, and only debeard those. Debearding may be necessary for more than decorative purposes if the mussels have a lot of ‘beards’, but this is generally not the case with the mussels I get here. Thats a good solution – hadnt thought of it! Great, great tip, Stefan! My fingers usually get so messy that, sometimes, I feel discouraged to eat this delicious fruit. My parents used to put out sheets of newspaper, plop me in the center, and hand me a pomegranate when I was young. What a mess I used to make! Thanks for the technique…now if only my parents had known about this one.